Moving to the other side of Alston Street we have Margaret Bunton, a widow aged 56, living in a large tenement at number 44. Living with her in 1861 were her daughter aged 26, a white seam sewer, and a lodger, Alex Taylor, a railway porter aged 32. In the tenement next door at 42 two of the heads of household were James Miller, a stone labourer, and Duncan McEwen, a carter. The Miller household included Elizabeth Miller and their two sons, James a gilder of 18 and Thomas a metal worker of 16. It also included two lodgers, William Wood, a scholar aged 9, and Jane Sinclair, a scholar aged 6. Living with Duncan McEwen were his wife Elizabeth, their two children aged 4 and 2, and a lodger, Archie McDonald, a labourer aged 20. Another family who may have been obliged to move by the opening of the Central Station were the McColls. Originally from the island of Lismore John and Christina McColl moved with two daughters to Glasgow around 1850. In 1861 they were living at 42 Alston Street with six children. By 1871 they had moved into the neighbouring tenement at 44 Alston Street and three more children had joined the family. At the time of the 1881 census they were living a short distance to the north west in St Vincent Street. If it is true that the McColls were compelled to move away from Alston Street I do not know whether they would have received any kind of support from the Caledonian Railway Company. As well as opening the Central Station the Caledonian Railway Company built a large hotel, the Central Station Hotel, adjacent to the north west corner of the station. Then within a few years it became clear that the station was not large enough to cope with the volume of railway traffic. Further land was purchased on the west side of the station and an extension was built. On this occasion the main building that had to go was St Columba's Church, a Gaelic church on the east side of Hope Street. It is marked 4 on the map on page 3 and is clearly visible in the aerial view of 1853. The congregation consisted largely of people with roots in the Highlands of Scotland. It was replaced in 1904 by a new church at 300 St Vincent Street. I mentioned earlier that just two buildings are known to have survived from the time before Grahamston was annexed by the city of Glasgow. One is the building now partly occupied by the Grant Arms. The other is the building at 59 Union Street where the Rennie Mackintosh Hotel now occupies the upper four floors. It appears that since it was erected in the very early nineteenth century the ground floor of this building has consisted of a row of shops, with some kind of lodging house or hotel on the floors above. At the time of the 1861 census it was described as a lodging house run by Elizabeth Taylor, an unmarried woman of 46, and Elizabeth Hurst, a widow aged 46, both of whom had been born in Stirlingshire. They must have kept up their link with their county of origin as they had two servants from Stirlingshire, Jane Stoddart aged 14 and Frederick Sheffield aged 16. They also had four lodgers, a wool merchant and three commercial travellers from England. Between 1873 and 1883 the hotel changed hands several times, though generally it retained an emphasis on the moral welfare of its guests. 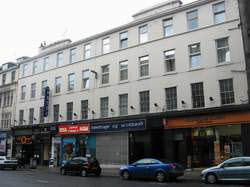 According to the Post Office Glasgow Directory of 1873-74 it was then Taylor's Temperance Hotel, but from 1877 to 1880, the period when the Central Station was under construction, it was a lodging house run by the Young Women's Christian Association. 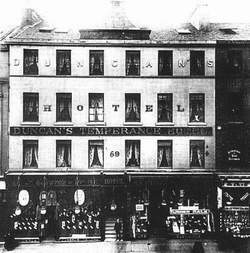 In 1881-82 it was called the Windsor Hotel, but by 1883 it had become Duncan's Temperance Hotel. It retained that name for over a century, except that at some point the word Temperance was dropped. Its transformation into the Rennie Mackintosh Hotel is a relatively recent development. 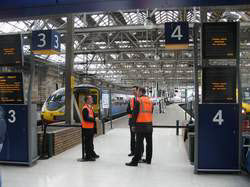 Anyone travelling by train today from the southern countries of Britain is likely to come into Glasgow Central Station on Platform 3. As they step out of the train they will be directly above the line of the old Alston Street. From time to time rumours arise of sightings of fragments of the old Grahamston. Claims have been made that sections of cobbled streets or the fronts of shops have been seen. Satisfactory evidence in support of these claims has not so far been forthcoming. However, the search goes on. People have even been known to climb out on to the roof of the Central Hotel in the hope of catching a glimpse of Grahamston far below. 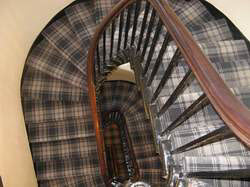 The staircase inside the Rennie Mackintosh Hotel. This is not a place to be recommended to people with impaired mobility. The location of Alston Street.